Note that everything will depend on the amount of available space you have and the amount of inputs/resources you have at your disposal. 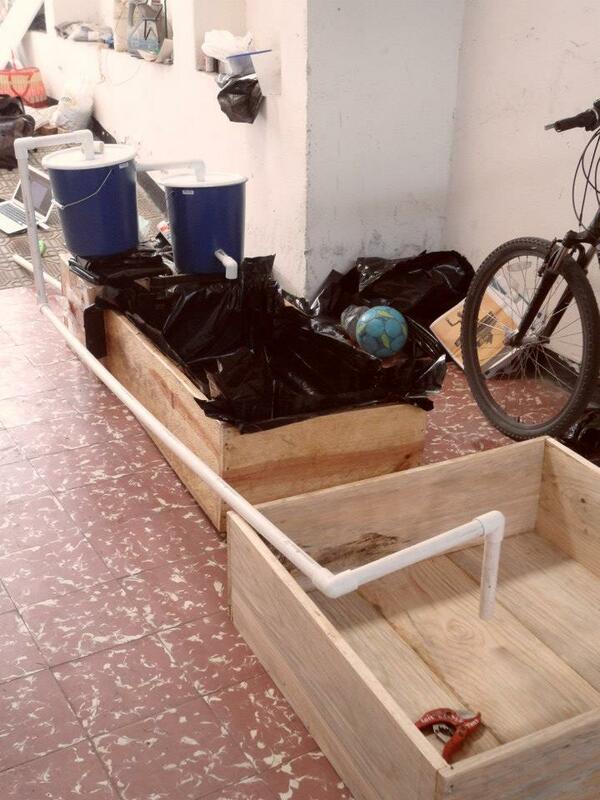 The following is the documentation of a household garden we built as a demonstration project for our One School One Garden (OSOG) program in Xela, Guatemala. 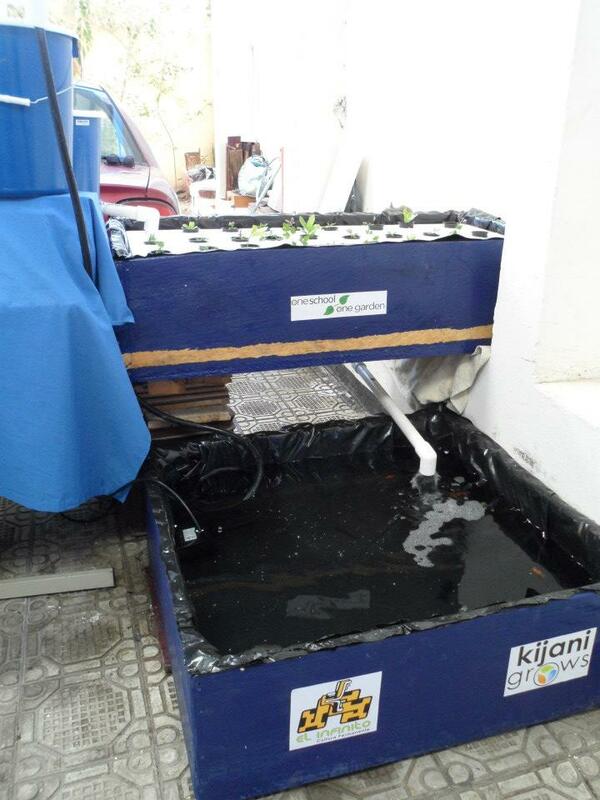 The entire garden, including parts like pumps and grow lights cost around $250. 2 – Temperature – can your fish and plants live at the temperatures? 4 – What type of garden? We used a floating raft system. I had the carpenter use thick lumber to make sure it could support the weight of the water. 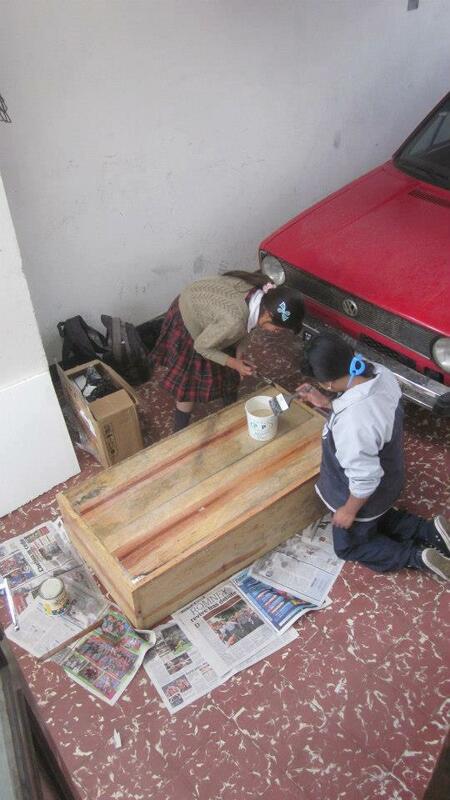 With grow bed in hand we needed to apply waterproof laquer since we’re putting this garden outside. Remove dust, sand it down and then apply coat #1. Wait 24 hours and then apply second coat. Use silicone to seal all the seams. In Oakland we have the luxury of using “liquid liner” but we went with a more simple thick plastic liner that cost about $3. Line the inside of the grow bed and tighten around the edges. Be careful not to open any holes in the plastic lining. Then nail the plastic to the top of the grow bed walls to keep everything in place. Drill a hole 1.75” in the bottom the grow bed, 5” from the center line of the bed. Screw in and glue the bulkhead adapter into the hole. Make sure this seal is PERFECT because this would be the worst leak to have! This is where you’ll put in your piece of PVC to serve as the grow bed drain. Build your finish tank and repeat steps #2-#4. 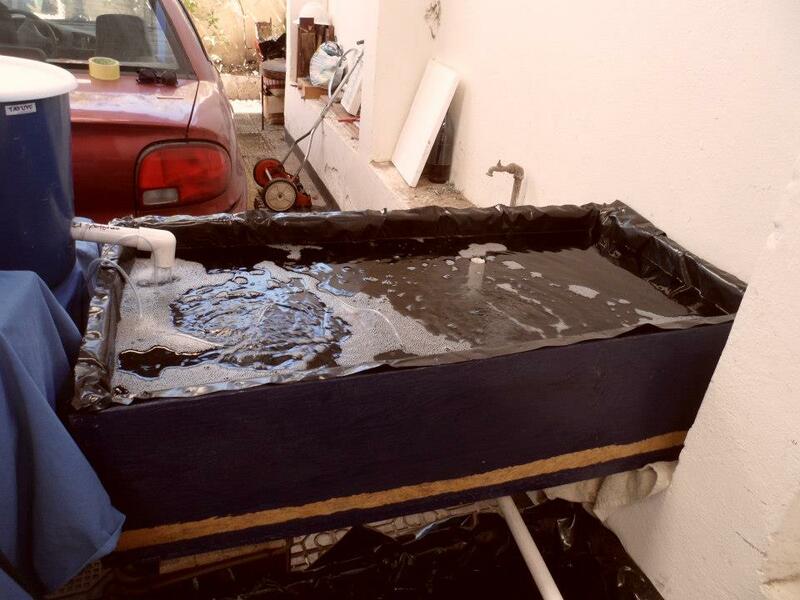 Remember that the general rule of thumb is 1:1 for volume of grow bed to volume of fish tank. 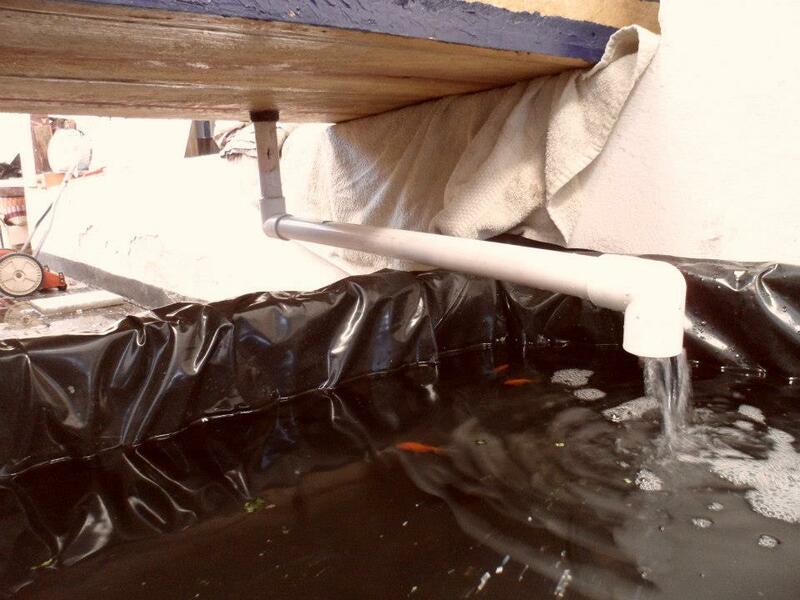 Place the submersible pump into the fish tank and connect the rubber tubing that you’ll eventually connect to the input of bucket filter #1. Drill a 1” hole in the top of one of the buckets. Slide an 8” piece of 1” PVC through the hole with about two inches protruding from the top and glue around the seam on both sides. Then glue an elbow piece and a piece of PVC about 6” long to create an “arm”. This is where you’ll place the rubber tubing coming from the tank pump. At the bottom of the PVC piece glue a 1” PVC “T” and then two elbows facing in opposite directions. This is where the water will empty into the bucket filter. Drill a 1” hole in the side of the bucket, about 2” below the top. Slide an 8” piece of 1” PVC through the hole, leaving about an inch of PVC on the inside of the bucket. 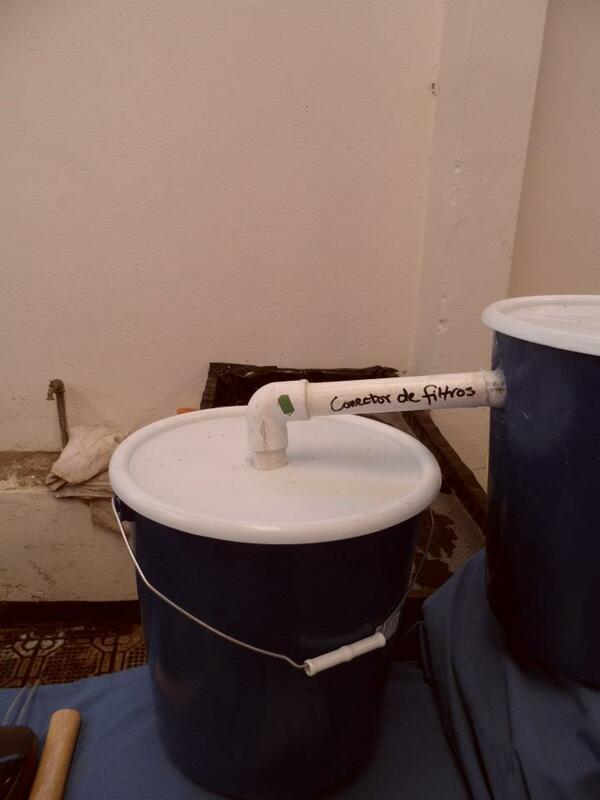 You’ll want to angle the PVC downwards a bit so that water will flow naturally to bucket filter #2. Glue as you did in Step #7 and then slide the 1” rubber O-ring from the interior side and glue to the seam to strengthen the seal. This piece will connect to the input of bucket filter #2. Fill the bucket about 3/4 of the way with untreated scotch brite that you can buy at any grocery store. 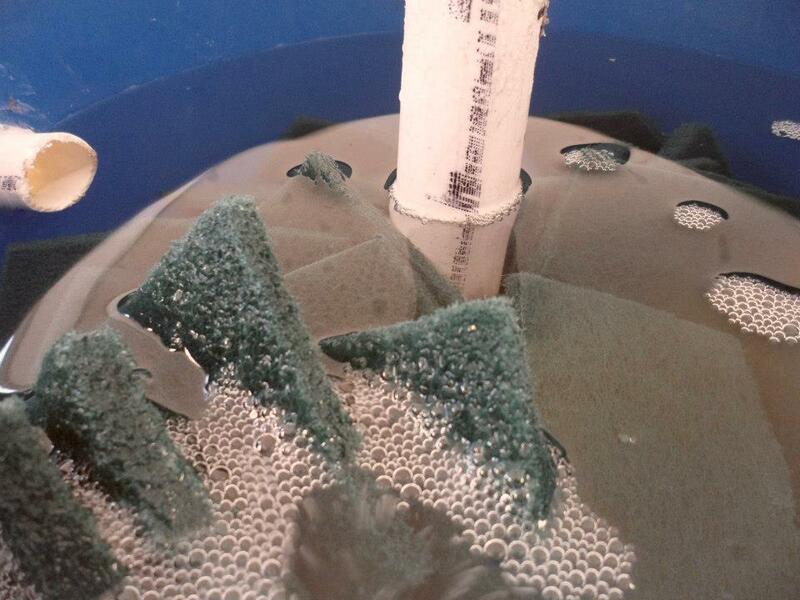 This material will filter out the particulates (fish waste, uneaten food, leaves, etc.) from the water. Glue a 1” PVC elbow to the end of the output of filter #1. Drill a 1” hole in the top of the bucket #2 and insert a piece of PVC about 5 inches long, with its halfway point in the hole. Glue the hole and then using a combination of elbows and random scraps of PVC build a U more or less so that the incoming water spits out at the top of the filter and trickles down the scotch brite. Drill another 1” hole in the side of the bucket, about 2” above the bottom. Insert a PVC piece into the hole, glue it in place and glue an O-ring. We used about a 5” piece but the distance you need to travel to return water to the grow bed will determine your length. Glue an elbow at the end of the return so it drops the water into the grow bed nicely. Glue the output of bucket #1 to the input of bucket #2. Then I’d go around and silicone seal all the joints for extra security. 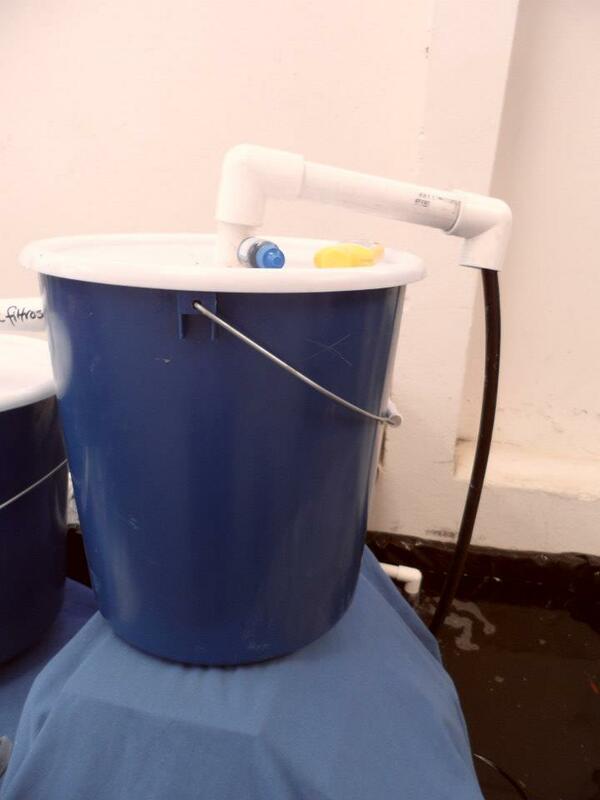 Finally, fill the second bucket with scrotch brite and your filters are good to go! Stick a piece of PVC into the bulkhead adapter within the grow bed – the piece should be about 2”-3” shorter than the top of the grow bed. No need to glue this piece. Measure out styrofoam so that it fits within the grow bed walls with an inch or two of space on each side. 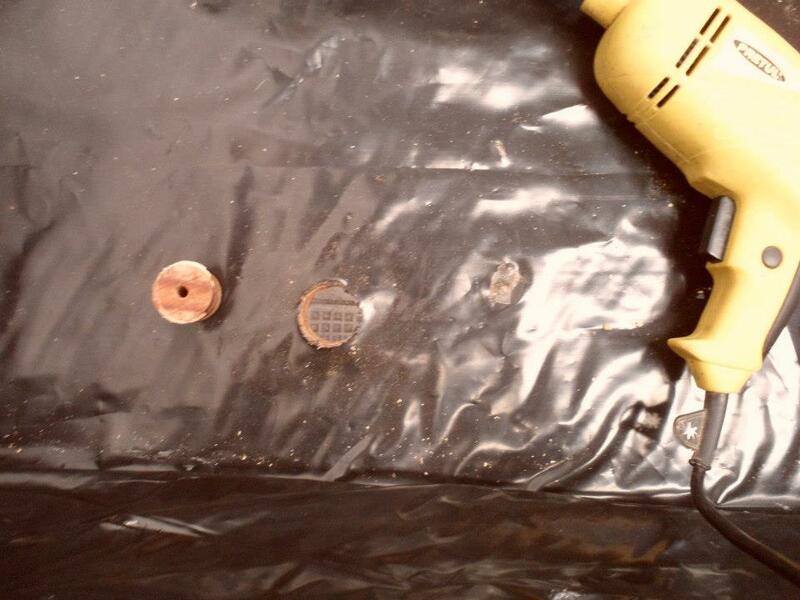 Then cut holes into the styrofoam to fit your hydroponic grow pots – ours are about 2” in diameter. Note that you will likely have to cut a hole into the styrofoam to let your drain get air. Fill with water and then start cycling! Once you fill the tanks you should apply some chemicals you can buy at the pet store to make sure the tap water is safe for the fish. We are currently cycling with fish and we chose Koi because they’re relatively cheap and hardy fish that can survive in the cold night time temperatures of Xela.